You don’t need long arms to hold a karaoke microphone. 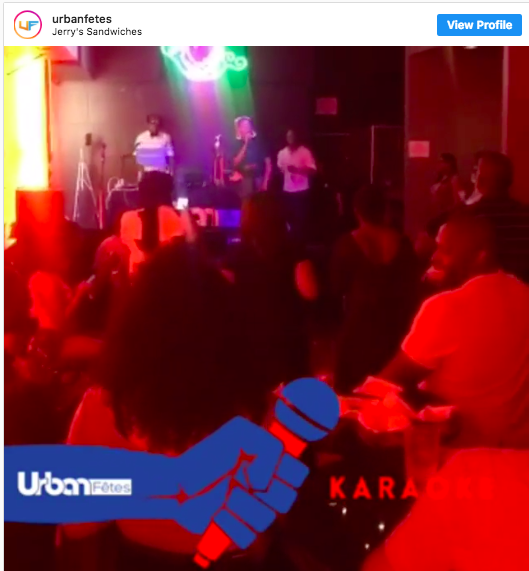 Find your next karaoke night, rent a private karaoke room, sing with a live band, discover movie/video karaoke or practice for (or plan for) your next lip sync battle in Chicago. The (lack of) hills are alive! With the sound of You-sic, Ah-ahh-ahh-ahhhh! Some lucky souls are born with serious pipes. Some of us think we have serious pipes after a few cocktails but are actually the world’s Kara-OKAY-est singers to ever grace the stage. 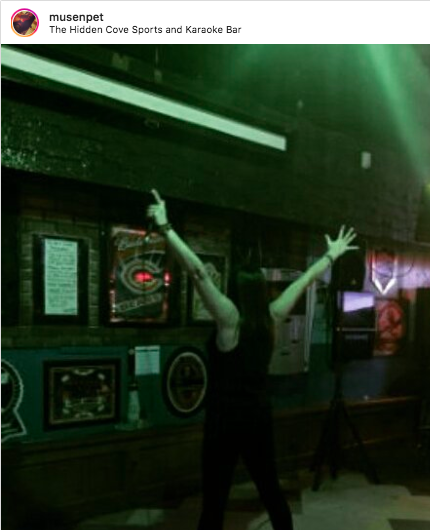 Whatever your situation, karaoke is a fun group outing or spiritual endeavor to express yourself in song. Karaoke comes in the form of pop-up karaoke nights, full on karaoke bars, as an accessory to a restaurant, or as a competitive league. Shy performers may prefer a private karaoke room. For more dedicated singers, the Second City Karaoke League may be your jam. Performers from all walks of life gather for weekly drinks, songs, and friendly competition. Location varies, but have included Brando's Speakeasy downtown, Mad River Bar and Grill, Elbo Room, and Jerry's Wicker Park, which sadly closed September 2016. Jerry's was home to karaoke leagues and rap karaoke. Trader Todd's is a true karaoke bar as they have karaoke every night of the week. Sidekick's has been on Eater's top karaoke bars list, and it's on ours too - Bevvers can enjoy karaoke any night of the week in addition to darts, Golden Tee, Harley Davidson pinball. On Wednesday nights local musicians perform during open mic night, but karaoke is still available in between live music performances. Hidden Cove is a local dive in Lincoln Square with strong karaoke game - here you can also be a star any night of the week. Lan's Old Town has on-demand karaoke any time, but is most popular on weekend nights. 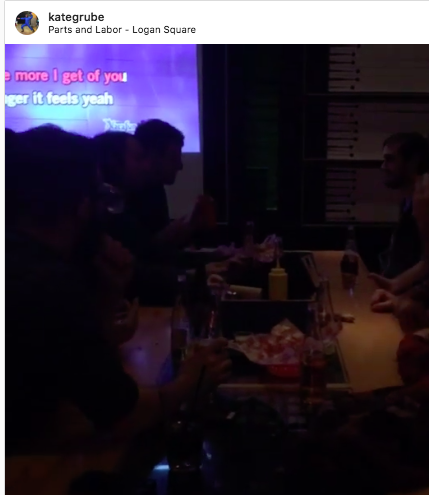 Lan's is Chicago's only BYOB karaoke venue, meaning you can bring your own booze, have some Szechwan and mandarin grub and sing the night away - very budget friendly! Louie's Pub in Lincoln Park has free Karaoke most nights (Tues - Sun) at 8pm, and takes reservations for parties of 6 or more. Blue Frog's Local 22 hosts Karaoke Tuesday – Saturday starting at 10pm. Brando's is a speakeasy in the Loop that's easy to get to and ready to party with on-demand karaoke. Speak easy, sing easy. What's even more fun about Brando's is the variety of events to join. For example, Brando's hosts lip sync battles, variety shows and meetups. Murasaki is a sake lounge in Streeterville with an extensive Japanese whiskey list and private karaoke rooms available for rent for $35-45/hour (check current prices here). Their song list is even broader than the whiskey selection with over 10,000 English and 130,000 Japanese song titles. 15/20 Lounge in Chinatown has karaoke every night of the week and private karaoke rooms. VIP private rooms have their own designated bathrooms for those who hate waiting in line. Recently featured in Chicago Eater, 15/20's food menu has a variety of options from pig ears to fried ice cream. No. 18 Karaoke and Sakura Lounge in Chinatown also offer private karaoke rooms for an hourly fee. Pop KTV in Chinatown has open and private room karaoke every night of the week, and its song list includes English, Japanese, Chinese, and Korean song choices with their respective music videos playing in the background as you sing. Yeowoosai in West Rogers Park and Lincoln Karaoke in Lincoln Square are north side private room karaoke options. Piece Brewery and Pizzeria is home to live band karaoke Saturday nights in Wicker Park. Even if the person singing is a bust, their beers have won awards at the Great American Beer Festival and will soothe the pain (or warm up your vocal chords). If you're up for a weekend encore, Stanley's Kitchen and Tap has live band karaoke Sunday nights at 10pm, with $3 Miller High Life and $5 Jameson to boot. In River North, Clark Street Ale House has live band karaoke on Thursday nights at 10:30pm. If you're looking for the full Carrie Underwood experience, head to Bub City in River North. Their Tuesday night live band karaoke is boot-scootin rockin' good fun. The Rabbit Hole in Old Town has live band karaoke in its cozy, Alice in Wonderland-themed bar Wednesday nights at 9pm. Roscoe's Tavern in Boystown has live band karaoke on Monday nights, and regular karaoke featuring over 18,000 songs on Wednesday nights. Rockwood Place has also hosted live band karaoke nights in Wrigleyville. Sometimes it’s fun to sing along to songs with a bunch of other people. While some may scratch that itch at church, others can head to a bar for the sense of community and music. Holiday sing alongs are popular seasonal events. The Music Box screens holiday movies like Sound of Music with sing along showings, where the crowd is encouraged to do-ray-me. Scarlet in Boystown hosts special event sing alongs in addition to their lively line up of diva performances. Timothy O'Toole's is a popular Streeterville Irish bar that not only serves delicious craft beers, but also hosts karaoke every Tuesday night at 10:30pm. Charlie's in Boystown has double the fun with karaoke on both Sundays and Tuesdays. Shakers on Clark is a Wednesday night karaoke option in Boystown, their jukebox karaoke starts t 10:30pm. Mary's Attic hosts 'MaryOke' on Sunday and Wednesday nights, where you have the option to have an acoustic guitar and backup singer accompany you. Davenport's is a piano bar and cabaret in West Town with karaoke on Friday nights. Parts and Labor in Logan Square is the only place in Chicago where you can pair karaoke with a Green River float. Karaoke happens Wednesday nights, and a great selection of craft sodas and beers on tap are always available. The Whistler has been the longstanding 'mothership' of movieoke in Chicago. What's movieoke, you ask? Well it's like karaoke, except instead of choosing a song, you select from over 300 movie scenes and act out that scene on stage. The Whistler hosts the fun the first Monday of every month, but there are also pop-up movieokes around town. Follow the Chicago Movieoke page on Facebook for information on upcoming events, and grab a friend to mini-flix and chill. Alice's Lounge is a popular karaoke lounge a stone's throw from the Revolution Brewing tap room. Even local celebs go there, such as Chicago Cubs announcer Len Kasper. 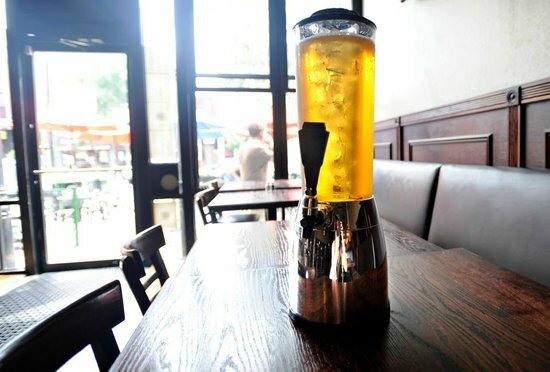 Division Ale House hosts karaoke Sunday nights, and is the only location where you can pair karaoke with an 80 ounce beer tower or a house infused bacon vodka shot. Sunday specials include $4 Revolution pints ($6 with a whiskey shot), $3 mimosas or $12 champagne bottles served with orange juice. Kincade's hosts weekly karaoke on Wednesday nights in Lincoln Park, and is a great place to pair karaoke with dollar beers. Logan Square's Madison Public House hosts karaoke at 9pm on Friday nights and 10pm on Saturday nights. Have a $4 brew of the month or a $5 bird dog Arnold Palmer and take a swing at your favorite hit! If you prefer to pair karaoke with Margaritas, El Taco Veloz has the answer in Ukranian Village.